The Infection Control and Human Factors Laboratories Zurich (HumanLabZ) is a boundary-spanning applied research group based at the University Hospital of Zurich. As an applied research group, our mission is to conduct and disseminate high quality, clinically relevant research that can be translated into improving the quality of patient care at the University Hospital of Zurich and in other hospitals worldwide. We bring together researchers and clinicians from a diverse range of specialties in order to foster divergent thinking that can result in intersectional innovations with the potential to transform healthcare delivery. Our core team is composed of individuals with expertise in infectious diseases and hospital epidemiology, as well as human factors engineering, psychology, implementation science, and information technology. The invisible nature of infection-causing microorganisms is a major barrier to safe infection prevention behaviour. In this project, we employ Virtual Reality technology to create a virtual patient room where we make germ-transmission visible. 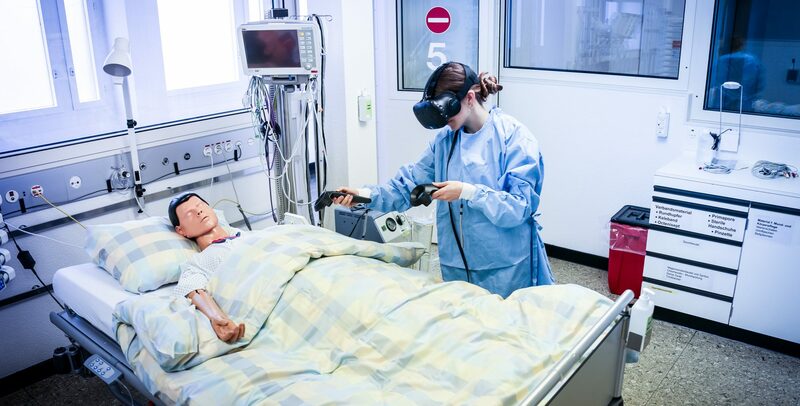 Our goal is that the experiential learning experienced in the virtual reality will have a lasting positive impact on healthcare provider hand hygiene in the real world. See more about this project, featured on the Swiss Television here. See a research abstract from this project here. This SNF-funded project applies principles and methods from the field of human factors engineering (e.g. structured observations, task analysis) and from the social sciences (e.g. Video-reflexive ethnography, concept mapping). In a first part, we identify a broad range of potential infectious risk behaviours, which include, yet go beyond indications for hand hygiene, such as those involving the misuse of gloves, medical devices, mobile objects, and healthcare provider clothing and accessories. In a second part, we employ multiple techniques to identify the behavioural determinants of safe vs. unsafe healthcare provider behaviours. Read more about the project here. The hands of healthcare providers are largely recognised as the most important vehicles in the transmission of pathogens that cause patient colonisation and infection – yet the exact nature of hand-to-surface contacts during actual patient care remains largely unknown. We undertake an observational study in which healthcare providers wear a head-camera during acute patient care. Hand-to-surface contacts are then systematically coded. The approach used in this study is in line with a human factors task analysis, whose underlying principle is to break down a task to study its individual elements. In doing so, we hope to understand the factors that influence individual hand-to-surface contacts and understand what can be done to reduce transmission of pathogens via healthcare provider hands. See the publication here. In healthcare speaking up as the raising of concerns has been identified as an important team process influencing patient safety. Nevertheless, interventions training staff in speaking up for safe behaviour are rare. In collaboration with the ETH Zurich we conduct a speaking up intervention targeting hand hygiene behaviour. By teaching specific communication techniques how to speak up we apply a team approach to increase risk perception and safety in our hospital. The five moments for hand hygiene appear clear and simple. Yet, applying these rules to anaesthesia often leads to challenges and confusion due to the complex environment. A series of projects led by ETH students have been undertaken to systematically analyse current hand hygiene practices in the context of complex anaesthesia task workload (Ysabelle Knill), and employing structured task analysis to propose novel hand hygiene recommendations (Markus Auly). These projects are based on the systematic analysis of 60 video observations of real anaesthesia inductions, as well as extensive live observations and clinician interviews. We aim to identify the limitations of the five moments concept in anaesthesia and to redesign a more practical concept for the future to increase adherence to hand hygiene guidelines. In collaboration with the University of Michigan Healthcare System, this study aims to assess the influence of physician attire on patient satisfaction and specific patient perceptions including physician knowledge, sense of trust, level of caring and feeling of comfort provided by their physician. This study is being conducted in several inpatient units, outpatient clinics, and ophthalmology clinics throughout the United States as well as in Italy, Japan, and Switzerland. Check out our lab’s work, featured in the media!